John Shafer Wilson was born near Keokuk, Iowa on August 3, 1837 and died near Teague 2 July 1905 at age 68. Married Mrs. Cressie Reaves in June 1864, Professed faith in Christ in August 1867. Missionary Baptist, leaves widow and two sons, Alex and Neal. Nursed by his wife in Military hospital in Memphis during the Civil War, moved to this county from Wayne County in 1897. JOHN SHAFER WILSON was the son of James and Susannah B. Shafer Wilson. He was born in Tecca, Lee County, Iowa. We know that John had at least two brothers, William and his twin James, and two sisters, Sarah and Susannah. John joined the 21st Missouri Volunteers in 1861, he was sent south and never returned to his home state. While in Memphis, Tennessee John came down with Smallpox and was in the Military Hospital there from January until June in 1864. He was nursed by Delila Christine Bonee Reaves, the daughter of John William Bonee and Nancy Thrailkill. Delila was the recent Widow of a Confederate Soldier, John Thomas Reaves, a Private in Company A, 6th Regiment of the Tennessee Cavalry. Their romance must have blossomed while John recovered from his illness. We have to wonder what her family must be have thought about their relationship. Imagine...a young southern widow nursing a Yankee Soldier back to health. John and Delila married in Memphis, Tennessee on June 19, 1864, right in the middle of the Civil War. Their wedding was held at the home of Delila's former Father-in-law who must have held John in high esteem. John and Delila had two sons, Steven Alexander who is buried in the old McCarley Cemetery along with his parents, and Cornelius Andrew who rests in the church cemetery located about a mile away. John was a member of New Union Missionary Baptist Church. In 1880, John legally adopted a two year old orphan girl, Sarah Ida Robinson Wilson. John was a farmer, he wasn't a wealthy person but paid the court cost to make this child his own knowing that he now had total responsibility for another human being...He had to have been a very good man. In 1890 he applied for and received an Invalid Pension for his service in the Civil War. He stated that he had, "Rheumatism from exertion and overheat on a march from Memphis, Tennessee to Oxford, Mississippi" and was wholly disabled. The 1890 Veterans Census lists him in Hardin County, Tennessee; "Left leg perishing away". In 1895 he applied for an increase in his Pension and added that, "his hearing is affected from a lick on the head at Harrisburg, Mississippi from a cannon ball striking the back of a caison". His Pension was $10.00 a month; Delila drew his widow’s Pension until she died in 1908. For 96 years John lay in an unmarked grave on private property in Hardeman County, TN where he lived prior to his death in 1905. 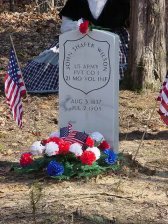 A civil war headstone was placed on John’s grave in June and a memorial service was conducted on November 17, 2001. John Shafer Wilson's memorial ceremony. Biographical information was generously provided by his great granddaughter Nell .